It was really a good experience to stay in City break and the host make me feel like at home of international people. 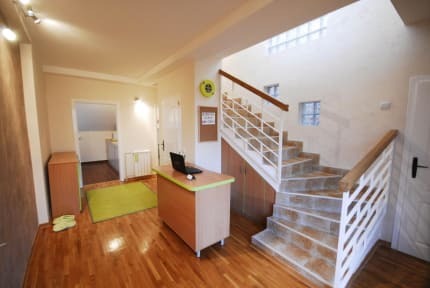 The hostel have all the facilities you need when traveling and in case I will visit again Belgrade, I will stay again in this hostel! Great place to stay! The owner is super helpful and the atmosphere there is very nice. 10/10 would recommend! We had a great time here, host is really friendly and accommodating. Its in an apartment so just a few dorm rooms and a cosy kitchen/living room. Feels more like a house share :) The place is tidy and clean. It is on 5th floor though so bare that in mind. Only 3 bathrooms but i never waited longer than a few minutes to use one. Centre of town is about 20min walk, which is pretty close considering how big Belgrade is. I'd recommend this place. I thought it could have been a bit more quiet in the common room. One night it was noisy later than it should have been. The sheets do not fit the beds. And maybe they need to be replaced. Pillows too. Also did not know it was cash to pay my balance. That should be stated upon check in. I had an enjoyable stay at City Break hostel where you could find everything you need for your stay. The manager is friendly and welcoming. Facilities were clean and modern. Lockers were big enough to fit large backpacks. Just a note that the hostel is located around 5 floors up and the hostel isn't overtly noticeable via a visible sign. The hostel is a bit further away from the centre but you can find lots of things to see around its immediate area. Be aware that this hostel locates in the 6th floor building without lift. And no explanation about that in the website or booking online site that there will be no elevator. If i know there is no elevator 1000percent I will not stay there... I just trapped in this hostel. The hostel is not easy to find because no clear sign/hotel name in front if building. Dark infront of building. But nice staff.